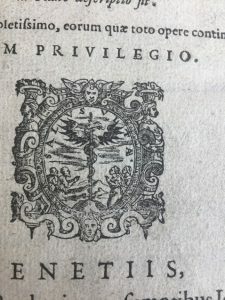 This week’s guest blogger is Hannah DeWitt, from the University of Edinburgh, School of Languages, Literatures and Cultures. 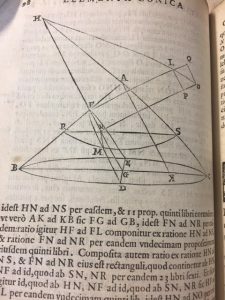 This week’s look at Venetian Images encounters mathematical figures that have remarkable continuity with modern textbooks. 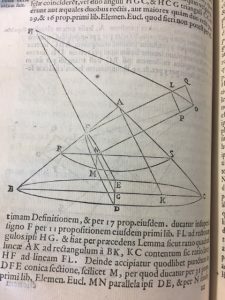 This text, Admirandum Illud Geometricum, was written by the influential Italian mathematician and astronomer Francesco Barozzi (1537-1604). Barozzi was born in Crete. He studied at the University of Padua and later lectured at the university. He is known for his efforts revive science and maths through re-examining the work of ancient mathematicians and philosophers. His work includes new interpretations and applications of ancient theories, particularly those of Euclid. 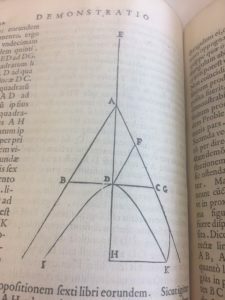 Previous to Admirandum Illud Geometricum, Barozzi translated and added commentary to Euclid’s Elements in Procli Diadochi (1560). He also translated texts by Archimedes and Hero. Barozzi led a tumultuous private life. At university, he was accused of taking someone’s hair without consent, an act that has been suggested to be linked with occult practices. Later in his life he was convicted by the Inquisition of an unknown charge. He was accused and tried for causing a terrible rainstorm in Crete. Eventually he was convicted and fined for sorcery. His translations of Nostradamus and interest in predictions contributed to his reputation for engaging in occult practices and his final conviction essentially ended his academic career. 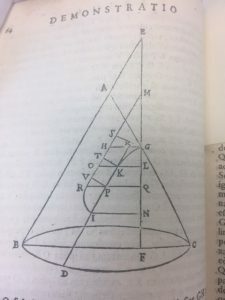 Admirandum Illud Geometricum is an exhaustive instructional text detailing thirteen different methods for producing parallel lines on a plane. 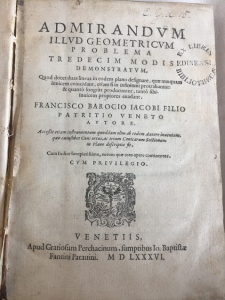 While Barozzi more typically worked on translation or commentary, this work is original, though it does frequently reference ancient mathematicians and classical theories. 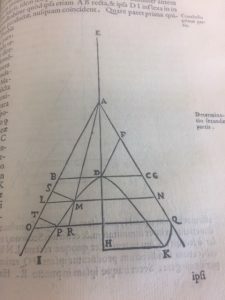 While the more interesting images are the mathematical figures, the title page printer’s device belonging to Gratioso Perchacino of Venice is worth mentioning. This woodcut of a winged serpent on a pole is most immediately associated with the caduceus, the staff of Hermes with two snakes and wings that is commonly misused to represent medical practices. The staff of Asclepius, the god of medicine, is meant to have one snake and no wings it the symbol which is appropriately meant to represent medicine. But as in the Barozzi image, it is often mixed with characteristics of the caduceus. Included in the device is “SALVS VITÆ” or “The Help of Life.” This phrase is frequently associated with the Roman goddess, Salus, the goddess of health and well-being. 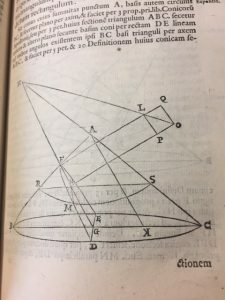 The most impressive images in the book are full page renderings of mathematical compasses. 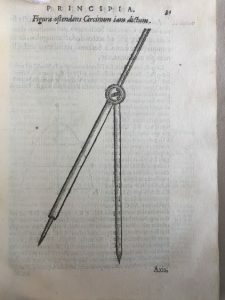 These are simple images with enough detail and exacting scale to elicit a startling recognition of similarities between and lack of change in the depicted compasses the modern versions of the same tool. It is also very likely that the exact dimensions of the woodcuts themselves were created by tracing the figures with similar tools. A second set of figures has a similar error. The three images appear on the same sheet in this instance, making the use of two blocks necessary. In these figures, a ‘N’ is inverted. While a majority of the images had the lettering carved into the woodcut, a few used type. 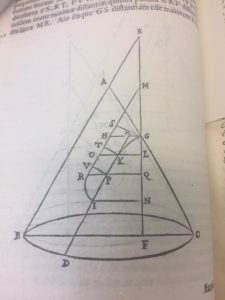 This can be seen in diagrams labeling the names of the shape. As the text progresses, the complicity of the figures and lessons increase. These more complex shapes frequently build on a simpler figure. 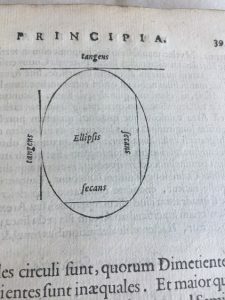 In order to achieve the precision of these diagrams, the first image would have needed to be traced or carefully measured and redrawn before adding the new elements of the second, more complex printing block. 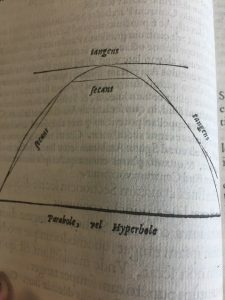 The variety and replication of the diagrams attest to Barozzi’s particular dedication to images as part of his teaching method. Two copies of this edition of the book are owned by the University of Edinburgh. One is bound in a light vellum binding and the other in a dark, ornate leather binding. The first copy (*O.21.3) bears no indication of ownership previous to the university. 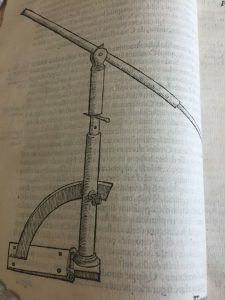 It has an 18th century Edinburgh shelfmark suggesting that it arrived in the second half of the century. 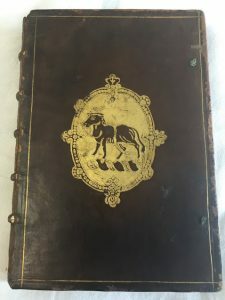 The second copy (*O.21.4) is more expensively bound and is stamped with a gilded owner’s stamp belonging to Sir John Rivers, 1st Baronet, who died in 1651. Rivers’ books, with this memorable stamp are scattered among a number of libraries in the U.K. and U.S.A. 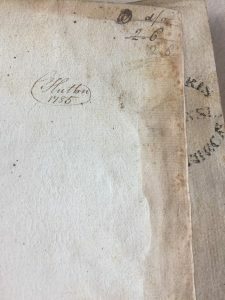 The signature of a second owner, C Hutton 1785, can be found on a flyleaf. Hutton was Professor of Mathematics at the Royal Military Academy in Woolwich, and would have had an obvious interest in . The precision and frequent duplication of images are unique to the care Barozzi shows in having this text printed. 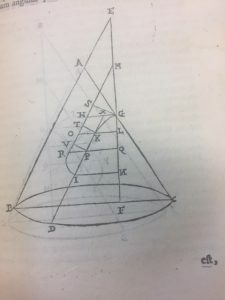 His dedication to what he believed was the superiority of mathematical certainty is evident in the attention to detail and effort placed in producing his diagrams.